SEA LEVEL: Rise and Fall – Part 3 – Computational Hubris | Watts Up With That? Sea Level Rise: Measured from Space? Tide Gauge data is invaluable for localities in determining tide states, sea surface levels relative to the land, and the rate of change of those levels — the only Sea Level data of concern for local governments and populations. However, Tide Gauge data, even the best station data from the GLOSS network, is only accurate to ±2 centimeters. All derived averages/means of tide gauge data including daily, weekly, monthly and annual means are also only accurate to ±2 centimeters. Claims of millimetric accuracy of means are unscientific and unsupportable. Tide gauge data is worthless for determining Global Sea Level and/or its change unless it has been explicitly corrected by an on-site CORS-like GPS reference station data capable of correcting for vertical land movement. Since the current standard for Tide Gauge data, the PSMSL GLOSS, is not corrected for vertical land movement, all studies based on this uncorrected PSMSL data producing Global Sea Level Rise findings of any kind — magnitude or rate-of-change — are based on data not suited for the purpose, are not scientifically sound and do not, cannot, inform us reliably about Global Sea Levels or Global Sea Level Change. WARNING: After struggling with this piece for more than a month, I find it is far longer than most readers will find comfortable. Again, you have my apologies, but for those seriously interested in the question of Sea Level Rise, I hope it will be worth your time. Bookmark it and come back to it when you have settled for the day into your most comfortable chair with your favorite evening beverage. There have been so many very good essays on Global Sea Level Rise by persons all of whom have a great deal more expertise than I. Jo Nova hosts a dozen or so excellent essays, which point at another score of papers and publications, for the most part clearly demonstrating that there are two contrarian positions on sea level rise in the scientific community: 1) Sea level has risen, is rising and will continue to rise at a rate approximately 8-12 inches (20-30 centimeters) per century — due to geological and long-term climatic forces well beyond our control; and 2a) Other than explicit cases of Local Relative SLR, the sea does not appear to be rising much over the last 50-70 years, if at all. 2b) If it is rising due to general warming of the climate it will not add much to position 1. For review, the generally accepted SLR graph for the last 130 years is this from Church and White, updated in 2015. My previous essays covered the Tide Gauge data; this essay focuses on the short satellite record, shown in green on the upper right, with my annotations. To bring us into the satellite era, I suggest starting with this essay at Jo Nova’s blog: “Are sea-levels rising? Nils-Axel Mörner documents a decided lack of rising seas” and work your way through the links to other posts and papers. Nils-Axel Mörner, past head of the Paleogeophysics and Geodynamics Institute in Stockholm, Sweden and one of the world’s leading experts on the rising and falling of seas, who has over 500 published peer-reviewed papers spread over the 70 scientific fields that ResearchGate lists as his areas of expertise, holds to the second opinion for the most part, allowing the first to be possible. The venerable Wiki on Mörner includes a statement that “Mörner’s claim that sea levels are not rising has been criticised for ignoring correctly calibrated satellite altimeter records all of which show that sea levels are rising.” The reference for this statement is a Comment published in “Global and Planetary Change 55”: “Comment on ‘Estimating future sea level change from past records’ by Nils-Axel Mörner” by R.S. Nerem and others. You should consider this when reading his comment to Mörner 2004 and whenever you see anything about sea level out of the SL Research Group @ the University of Colorado — their blog actually contains a link to this newspaper article, as if it were a scientific paper or something to be proud of. “Mörner was apparently oblivious to the corrections that must be made to the “raw” altimeter data in order to make correct use of the data. Note: That’s centimeters, not millimeters — to be clear, the original measurement accuracy defined for the Jason series, including the current Jason 3 altimetry function is +/- 3.4 cm, a whole order of magnitude greater than the claimed change, delta, in the Global Average SLR. Note that the Jason-3 portion (purple, upper right) is flat — showing no significant change in sea level since the beginning of its mission. 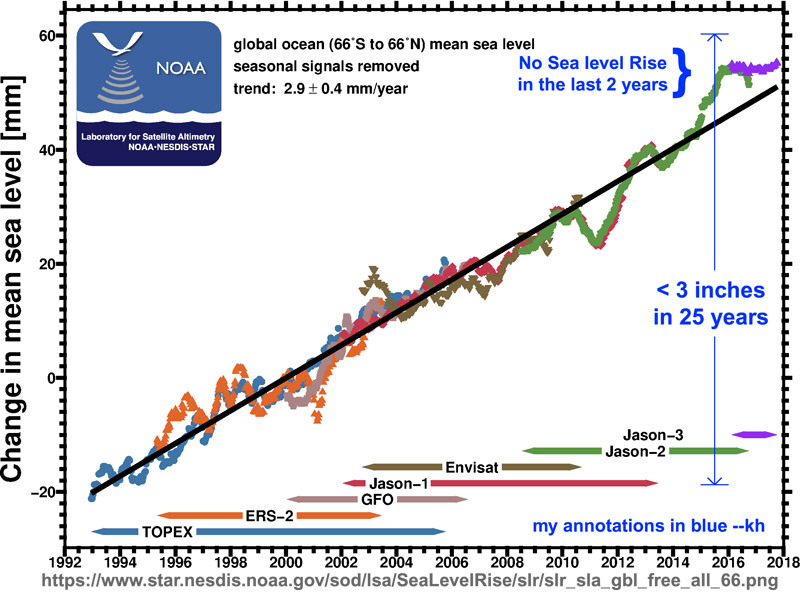 Of note as well is the fact that NOAA describes the long-term trend with a single straight line, a simple linear trend, unchanged for 25 years, quite unlike Nerem’s acceleration curve. Let’s try to set some of the record straight here. The paper, Mörner (2004) was written by Nils-Axel Mörner — but its conclusions are those of the INQUA Commission on Sea Level Changes and Coastal Evolution — which consisted of 102 academics from nearly every country in the world. [see the link listing the members and their institutions]. Nerem writes as if Mörner (2004) is the work of one sloppy misguided post-doc at a city college somewhere. Now, I can’t blame Nerem and his cohorts for being upset — I ’m believe they have worked their entire careers, most of them, on the satellite data sets — and done their best to make sense out of them. What they can’t seem to overcome, though, is the effect of the persistent enforced consensus view that sea levels must be rising and that they must be rising faster now that “the Earth is warming dangerously due to human activity”. Then along comes this guy who was already world famous for his expertise on the seas and ocean dynamics when they were all still undergrads and he says “it ain’t necessarily so.” That’s quite a blow. Note that the ”calibrations” are added in on top of the assumed tide-gauge-based — “We adopt the rate given by Douglas (1991,1995) of 1.8±0.1mm/yr”, Mitchum (2000) states.” — pre-determined, not observed — “ 1.8±0.1mm/yr” figure for long-term (100 year) global sea level rise. It is this point on which the whole SLR meme rests. All satellite sea level rise calculations start with the a priori assumption that the global seas are rising at 1.8mm/yr as a “base rate” — based on uncorrected tide gauges that measure not global sea level changes but local relative sea level changes — all of this data uncorrected for tide-gauge-site Vertical Land Movement and entirely unfit for this purpose. 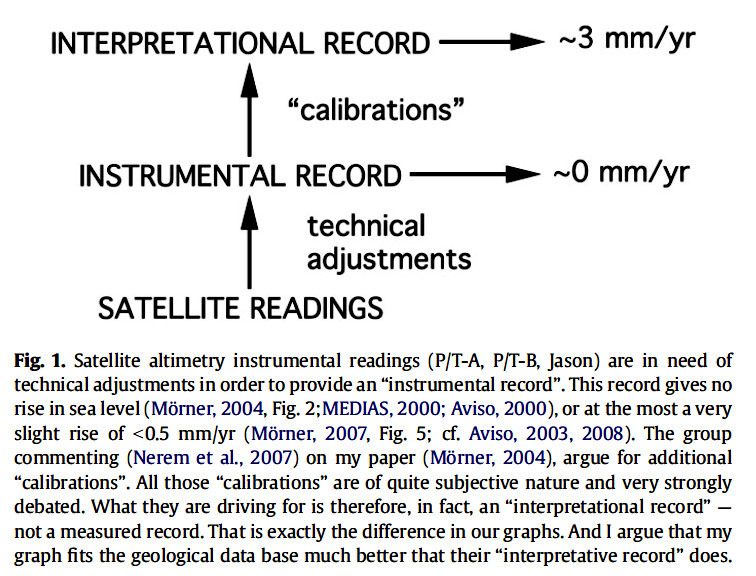 To the raw instrumental record, Mörner and the INQUA Commission’s 102 other academics say the current method of determining Global SLR adds “interpretational calibrations” that are entirely “opinion-dependent” to first agree with the “accepted” base rate of 1.8/mm/yr and then adjusting for other interpretations of satellite based-data — making the overall result also “opinion-dependent”. We must acknowledge that groups such as CU Seal Level Research Group are quite sure that their methods are valid and based on proper, scientifically supportable opinions — their own expert opinions based on their experience and interactions with other groups working on the same problems. They are entitled to their opinions — but the rigors of science demand that they separate out “opinion” from “scientific observational findings” — and present them separately. None of the Sea Level Groups do so. None of them present their data with any uncertainty estimates for the satellite based series nor any acknowledgement of original measurement uncertainty. Why do I use Mörner’s papers as an example? In the controversy over Sea Level Rise most of the squabbling is about rate of change and acceleration. But, in my opinion, the real problem lies much, much deeper in the whole approach to subject. In Parts 1 and 2, I looked at the questions of how sea level was measured on a local basis and illustrated why Tide Gauge data (our longest available data set concerning sea levels) was unsuited to determining long-term Global Sea Level change. I remind readers that even the most sensitive and modern acoustic Tide Gauges have an instantaneous accuracy of +/- 2 cm for each individual reading, and that that uncertainty range remains unchanged when these readings are averaged into 6-minute official records — the uncertainty still is recorded officially as +/- 2 cm. This uncertainty range is ten to twenty times the claimed change rate of global sea levels. The uncertainty derives from the fact that the sea does not lie still like the water in an unoccupied bathtub. It has ripples, waves, tides, wind chop, reflected waves, boat wakes — all of these are of differing magnitudes and frequencies and they add to and cancel out one another in chaotic patterns. When 180 instantaneous readings are averaged (after rejecting 3-sigma outliers) the result still can only be claimed accurate to +/- 2 cm. Please remember, this is a direct (-ish) measurement of a single location — and still, the result cannot achieve a precision greater than +/- 2 cm (plus or minus twenty millimeters). The data from NOAA’s CORS project illustrates that even with the highest quality GPS receivers continuously recording readings from the latest set of Global Navigation Satellites, it takes several years of data to accurately determine the rate of vertical change in position (Vertical Land Movement – VLM), even of these nominally stable, unmoving points. VLM of CORS sites, many of them now purposefully being deployed on the same structures as important Tide Gauges, is of same magnitude — single digit millimeters — as the claims made for Global Sea Level change. 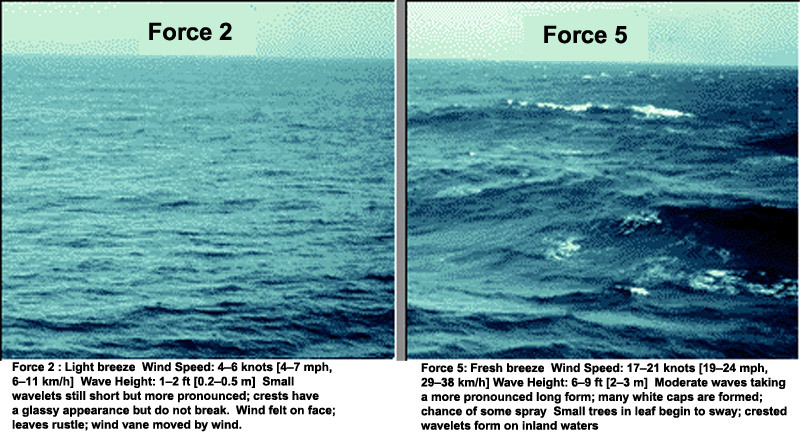 Note that the smallest irregularities in the sea surfaces pictured above would be measured in inches — in Force 5 conditions, they are measured in feet and meters. The Jason series satellites have an orbit height of 830 miles (1,336 kilometers). Their altimetry beam hits an area measured in kilometers squared. It hits sea surfaces that look like the images above (and worse). It records the time it takes for the beam to bounce back and the amount of “scatter” in the returned beam. The beam is affected by atmospheric conditions, such as humidity (and others). The data of the Jason altimetry system is thus primarily two bits — the time for the signal to return and some datum concerning the amount of scatter (noise) in the returned signal. Since Jason 3 has two bands of altimetry data, this data stream can be said to be doubled. The claim is that the condition of the sea surface can be corrected for “scatter” and precisely determine the sea surface height for those conditions — truthfully, it is no better than a random guess. This data is then corrected for “estimated” tides, the tidal waves [not to be confused with tsunamis] that travel across the seas arriving in your local port as High Tide and Low tide. How accurate are these estimates? NOAA states: “On average, the heights of observed and predicted high waters are within 0.147m (0.48 ft.); low waters are within 0.135m (0.44ft. ); and hourly heights are within 0.143m (0.47ft. ).“ The correction, the “calibration”, for tides is done with data known to be “on average” only accurate to around half a foot [ > +/- 140 mm]. As a side-check of the accuracy of the sea height data, NOAA uses a satellite pass over Corsica and checks their Tide Gauge data (accurate only to +3.5 ± 15.0 mm and unadjusted for VLM) as a ground-truth. [The +/- 18.5mm range is very close to NOAA’s +/- 2cm or 20mm range for tide gauges] As the satellite’s orbit is not perfect, it has slight irregularities, a laser-based system on the island helps to check the true orbit height to enable further calibrations. They also side-check against floating buoys at sea equipped with GPS receivers — buoys that are rising and falling, bouncing and jouncing, on those seas pictured above — buoys, which to be accurate to the millimetric scale, would have to be stationary and continuously operating at that same exact point for several years to determine their vertical location and its change rate. (ref: NOAA CORS Project). To a realistic, logical scientific mind, knowing the accuracy of Jason series altimetry is limited to +/- 3.4 centimeters (possibly as good as +/- 2 cm), the actual physical conditions of the object of measurement (the sea surface) and the magnitudes of the other multiple uncertainties inherent in the altimetry data set — many of which are orders of magnitude greater than the original measurement uncertainty — it is apparent that the claimed precision for annual change in Global Sea Level — a incredibly more complex and complicated measurement than the VLM of a single stable CORS site — is the result of massive computation — computation seemingly removed entirely from any careful, logical scientific consideration of the real world uncertainties involved. This result, precise only because it is the result of digital computation far more complex than that involved in Global Average Surface Temperature calculations, must, according to Nerem et al and other sea level teams, be “calibrated” — with “calibrations” themselves far far larger than the claimed annual change in sea level — to agree with pre-conceived opinions on what that change “should” look like. Nerem et al. confirm this [inadvertently] in their Comment. In the case of Sea Level measured from space, methods used to measure the altitude of stationary and relatively flat surfaces (land surface, for instance) and changes in vertical location of stationary points (CORS-like data) are being used to measure an “average” altitude of a vast area (71% of Earth’s surface) of fluid, non-stationary, ever changing [in fact, chaotically dynamic] ocean surface. The tools to do so are known to be only accurate to the scale of several centimeters (inches) under ideal conditions (not actual field conditions) and the confounding conditions for those measurements, which must be corrected for, being highly uncertain on a scale of at least one order of magnitude, in some cases, such as estimates of tides, two or more orders of magnitude, greater than the magnitude of the claimed result — furthermore, processing techniques and calibrations are opinion-dependent thus prone to being affected by the prevailing bias in the field. We see this today in much of science — not only in climatology — but in epidemiology, the detection of exoplanets, scientific cosmology and international economics. Are sea level groups like Nerem’s cheating? Cooking the books? Fudging the results? No, not actually. They are serious scientists trying to do a job and do it well. [Though some, like Nerem, also engage in unseemly advocacy and fanatical CAGW propaganda — as evidenced by Nerem’s Washington Post piece and his group’s Comment on Mörner’s (2004) paper.] The majority are doing what they have been trained to do, using the tools and data available. They have been trained to engage in what I have call “Computational Hubris”, and to accept its results without question. The problem, as I see it, is as described early in the computer era by Feynman and others — a scientific field gets rolling, builds on early results, and goes off down some garden path that becomes impossible to backtrack. No prestigious sea level group could possibly agree with Mörner and the INQUA Commission — it would mean that everything they’ve done, everything they’ve based their careers on, was off the mark. It is a rare (and precious) person that can do that. The vast majority will stay comfortably in the fold of the current consensus position, with which they honestly agree. John P. A. Ioannidis found the same situation in bio-medical research and published his findings as “Why Most Published Research Findings Are False”, concluding “for many current scientific fields, claimed research findings may often be simply accurate measures of the prevailing bias.” I fear that Sea Level Change research is one of those fields. I would place the rate of change anywhere from a low of minus .023mm/yr to a high of plus 2.3 mm/yr over the last 25 years (the satellite measurement era), with the most likely rate settling in just under a millimeter per year at around 0.8mm/yr — fairly close to Mörner/INQUA’s “+ 10 ± 10 cm [4 to 8 inches] in a century”. I could be wrong now, but I don’t think so! (h/t Randy Newman) Check back with me in a hundred years and we’ll see how close I got. Overall, the seas have been rising, slowly and inexorably, since the end of the last Ice Age. In general, they will continue to do so for the foreseeable future — at somewhere between 4-12 inches [10-30cm] per century. This rate is an imminent threat to populated areas built nominally at today’s existing sea level. It does not seem that sea levels are rising dangerously or rapidly, nor is the rise accelerating, on a global scale — though our ability to measure global changes at these very small (millimetric) magnitudes is highly questionable. If Morner (and his 101 colleagues of the INQUA Commission) are correct, there has not been much actual sea level rise at all over the last 25 years (the satellite altimetry era). I am always happy to read your comments and to try and answer your on-topic questions. 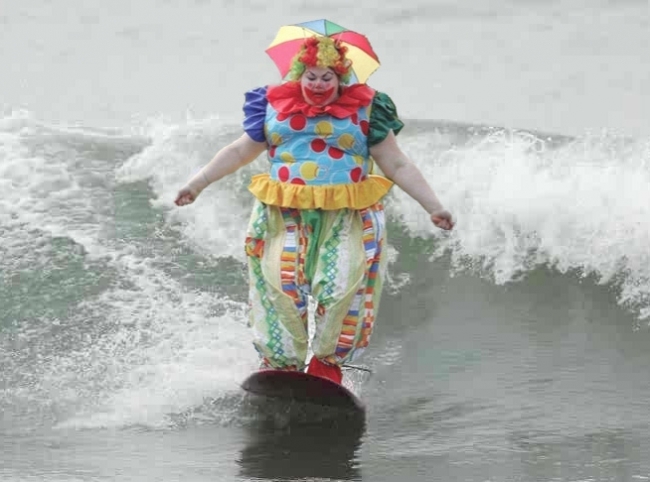 Sea Level Rise is being blatantly used as a scare tactic by advocates of Catastrophic Anthropogenic Global Warming/Climate Change in an attempt to keep the research dollars flowing and to bring about their desired social and political goals. I’m sure I’ve written things that you agree with and things you just hate. Let me know which is which. Keep it civil please and if you want a reply, specifically address your comment to me “Kip….” so I am sure to see it. December 19, 2017 in Sea level. A thorough well reasoned look at the current state of sea level scholarship. Thanks for the documentation of some of the failures of post modern “science”. Kip, I entirely agree with Mike. Many thanks for a clear well documented and argued explanation of this sorry chapter in the climate change bible. Willie Soon would be proud of you I expect. Alastair ==> Thank you. I saw your URL and thought you ran a “bb” — an online bulletin board. Gave away my age, there, I suspect. Inqua says ” best estimate of possible future sea level changes is + 10 ± 10 cm [4 to 8 inches] in a century or, maybe, even +5 ± 15 cm [2 to 8 inches].” 10 +/- 10 s/b 0 to 8 inches, and 5 +/- 15 s/b -4 to 8 inches. Was Inqua misquoted, or did they really make this simple mistake? The inch estimates are mine (added in) — so it is my error. Have no idea how or why I goofed it up. This bit “+ 10 +/-10 cm” is 4 inches per century (10cm) with possibilities down to zero or up to 8 inches. The second bit “+5 +/-15 cm” is 2 inches per century with the possibility of minus 4 inches to plus 8 inches. My opinion estimate was this “I would place the rate of change anywhere from a low of minus .023mm/yr to a high of plus 2.3 mm/yr over the last 25 years” or minus 0.6mm to 57mm over the 25 years — 0 to 2.25 inches over 25 years — if valid for a century, that’s 0 to 9 inches/century — pretty close to INQUA’s first “+ 10 +/-10 cm” ( 0 to 8 inches) per century. Apparently I just failed to note the lower (-) parts of the +/- for this conversion — too many conversions from mm/cm/inches/etc in this essay! Thanks for point this out. I’ll edit the essay above. On the Shell Brent Delta ( production platform ) in the northern North Sea, after a 5 year study , the “air gap” (sea level and underside of the deck ) was calculated on the 100 year wave. In the first year of production the 100 year wave (32 feet ) hit the platform 28 times ! What exactly does that have to do with sea level vs. the design-basis 100 year wave? Also, could you please provide a URL to that “5-year study” document. that a lack of data meant they did not really known what a 100 year wave was . rms ==> I think “z” was commenting on the roughness of the sea surface — following on to my Beaufort Force images and ocean wind speeds data. Noting that on the North Sewa Sea, 32 foot waves are not that rare. Satellite altimetry measures a signal bounced from a very uneven sea surface. If we don’t have a good statistical data on waves, the inetrpretation will be flawed. And that they most likely thought that wave height is normally distributed. Which hydrological parameters rarely or never are. Z’s observation is hugely relevant to those who design structures in and around the sea. If we design for, say, a lifespan of 100 years then climate-related sea level changes can be essentially ignored as they are lost within the estimation errors for much larger water level changes caused by tides, waves, storm surges etc. KRM ==> If only it were true that development was properly designed to take into account sea levels, tides, King Tides, Highest Water, Storm Surge, and rising local sea level. See my earlier essays; here, here, here, here, and here. Building in harm’s way seems to be irresistible. Kip ==> Thanks for your reply. I was hoping “k” would respond her/himself to explain the point. My assumption was that “k” was saying due to rising seas, the base water level was higher, which caused the air-gap to be smaller than designed, hence the so-called 100-year waves hit the bottom of the platform many more times than planned. Early in my career at the start of the North Sea development I was involved with helping set 100-year (and 500-year) design wave heights for proposed developments. Not easy when we of course did not have 100-years (or even close) data on wave heights. I had no involvement with Brent. I don’t recall spending much time worrying about sea-level rises, but getting the design wave height was a “very big deal” as it has a big impact on costs (capital and operational). Many design review meetings on just that topic. And yes, as “tty” pointed out, some erroneously take the data and assume normal distribution where in fact a skewed distribution is more in order. That’s why I was hoping to get from “k” the URL to the report he/she was alluding to. In that I was going to look at what they used for probability distribution and what sort of actual wave height history they had. Been interesting to see “normal” or “skewed”. Now, 30-40 years on, we have a lot more actual data of wave heights in the North Sea so I hope they have an easier time setting the design wave heights not based on some artificial “100-year” statistical number, but what air-gaps have been shown by experience to be required. rms ==> Thanks for sharing your real world experience with us on the planning and design of oil drilling platforms in the North Sea. Hard to spec something out when there is no real data! Now, years later, they have some at least. My grandfather was a north sea herring fisherman, he crewed as a teenager on sailing drifters and was skipper on the family’s first steam drifter in 1914 at the age of 21. He talked about ‘a great lump of water’ that would appear as if from nowhere. The reality was that different wavetrains had combined at that spot to produce a very tall wave. This happened to my father, a meteorologist on weatherships in the north Atlantic in 1950’s, when his stevenson screenon the bow of the ship was instantly removed by just such a wave. it doesn’t always reflect the reality of being at sea. sonofametman ==> Thanks for sharing that family story of what are sometimes called “rouge waves” these days. On a passage from the Virgin Islands back to the States, my wife and I were each napping in the forward cabins of our catamaran, overhead hatches open to funnel in the breeze, our youngest son at the helm, when, out of a glassy flat sea came a ten to 12 foot swell that broke over the bow and dump 50 or more gallons of sea water down each hatch onto the calmly sleep parents. Such things do happen. Thanks for an interesting and very relevant study. The pictures of the rough seas were appreciated as they reminded me that they are the norm and not the exception. This information is needed in an area of “science”.dominated by manipulated statistics and political pressure. This article has made my wife upset as she remembers the unpleasant trip across the Bay of Biscay when the waves were coming higher than our cabin balcony on deck 11. The average/median level seems to be rather irrelevant in considering potential damage to coastal habitations, its going to be the high tides and storm levels that breach the defences first . 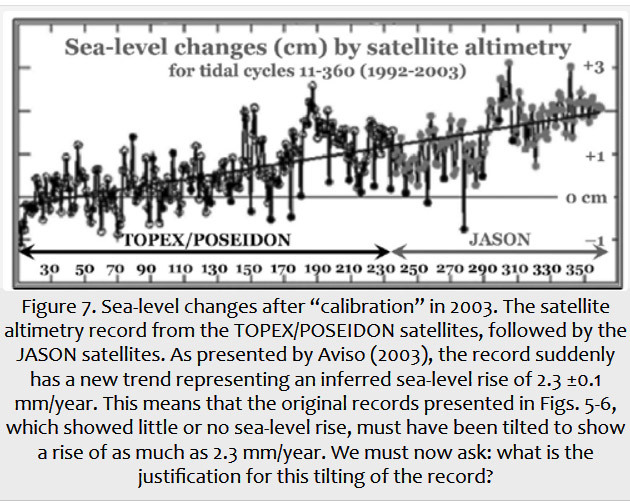 Why has an acceleration of sea level rise not been observed during the altimeter era? Colorado University hasn’t published a new release since September of 2016, they are way over due for an update. At this late date it looks like there won’t be a release in 2017. Considering their title that asks if acceleration is imminent, there’s an obvious expectation that when the next release comes out, they will find acceleration. It will be interesting to see if there are any significant changes to the historical data if that is the case. 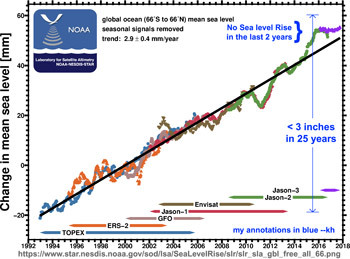 Steve ==> There is some perplexity amongst Sea Level Groups (there are so many, all with alphabet names) because the latest and greatest Jason-3 satellite, up almost two years now, simply refuses to show any sea level rise at all — even with all the “calibrations” they feel they can get away with. Without the calibrations, Jason-3 reports falling sea levels. Short periods of time with low or high sea level rise can occur as a result of abnormal rainfall patterns. For example the drop in sea level in late 2011 was attributed — maybe correctly — to abnormally high rainfall in the normally dry interior of Australia. Took a while for the water to find its way back into the sea. Three years seems a long time for a rainfall anomaly though. Without the calibrations, Jason-3 reports falling sea levels. Hmmmm, I didn’t know any of that. Could be the reason CU hasn’t updated their raw data page. Steve, thanks for bringing up the CU update. I don’t remember such a long period between updates. Given the NASA update being flat, it’s hard not to be cynical. Let us ask a simply question if we asked to come up with methodology design required to run an experiment to produced a scientifically valid measurement of ocean levels. What would it look like , how many measurements would it require , how often would these need to be done and how accurate would they required to be to give this measure real precision ? Now compare that with what is actual in place right now, and would it be a good match, inadequate or excessive or in fact nowhere close on any factors to what is actual required if, as claimed, this measurement can be made to two of three decimal places. In short currently the idea has no meaning beyond guessimate , throwing computing power at something does not overcome your inability to actual measure it. It merely makes your guess look smarter. knr ==> It might be possible, with the latest satellite positioning systems, to establish a series of “stable points” from which to measure sea levels using tide gauges corrected for VLM, strategically located around the world to first get an accurate idea of regional sea level changes and then, from that, get some understanding of global eustatic sea level change. Such a system is being worked on, tide gauges coupled with continuously operating GPS stations mounted on the identical structure with the tide gauges…but it will be many years yet before useful information can be gleaned from this effort. It is simply really to known you have to measure to be able to measure accurately you need to match the range and precision requirements of the task no matter what the task is. If you do not they you are ‘guessing ‘ , throwing maths or computing power at it does not make up for the basic inability to have an accurate measurement in the first place. It merely makes the guess look better. Therefore, in an ideal world what would such a network look like for given good scientific validity to this value, and how far are we away from it. In the past this was not known question but now its all ‘settled science ‘ and claims of two or three decimal place precision for this value . So it is more than fair that the basic question ‘ can we measures it in a manner which supports this claim’ , is asked . Thank you for a well-reasoned and eminently readable presentation. I get the impression that a lot of academics should get out of their ivory towers and take a view of their subject from a different perspective, and then apply logic and sound scientific reasoning to their pet subjects. ==> Thanks for that interesting essay. Well done. A good explanation and summary of a complicated issue. Not too long. Required two of my favourite evening beverage. Will make a point of going back to read Parts 1 & 2. Andy ==> Thank you…I wouldn’t recommend buying a canal-front house in Miami Beach, though. For beachfront, I suggest Manhattan Beach, California, about three blocks up the rather steep hill from the beach — beautiful views of sunsets, California beach beauties, and early morning surfing. rocketscientist ==> One long bit of heaven on Earth to me…..spent most of my teenage years surfing from Torrance Cliffs to Malibu…..200 beach days one calendar year. I have been pointing out the accuracy of the Jason satellites for some time. It is at 3.4cm but they are hoping to bring it down to 2cm eventually. Of course that cannot just be a software upgrade. I thought they were replacing Jason with a new one….because Jason was giving erroneous measurements? Latitude ==> quite right, but the new Jason-3 went up in January 2016 to correct problems with Jason-2. They surely plan to improve the estimates in post processing. To some extent, that’s probably a reasonable expectation due to better guesses at biases and instrument drift. OTOH maybe their expectations go beyond what can actually be accomplished. Another terrific article Kip. There are dozens of things there worthy of discussion. I’ll hit a few now and possibly come back later for others. 1. I find that it helps to normalize sea level change numbers to microns — millions of a meter. e.g. 1mm/year = 1000 microns, one inch = 25400 microns. Using microns gets all the numbers one is likely to deal with into the same units with nothing incomprehensibly huge and virtually no need for fractions. How big is a micron? It’s tiny. A sheet of copier paper or a human hair are about 100 microns thick. For SLR, we’re talking 1000-3300 microns per year. That’s decidedly not scary. 2. I think you are entirely too kind to the miscreants at CU. How else to you account for their roughly 300 micron per year sea level volume “correction”. If they can’t report eustatic sea level, they should find a job better suited to their skill set. Something in food service perhaps. Don K ==> Thank you, sir. Most of the readers here have trouble enough keeping up with feet/inches, centimeters/meters — and I try my best to give both systems in hopes that the majority of readers get a good practical idea of the size of these things….truthfully, our American readers do not have a good grasp of “one millimeter”….but the best hint is “a bit thinner than a dime”. As a structural engineer I see this happen all the time. Foundations move!….a tide gauge has a foundation like any other structure. Since most are located in harbors that typically have soils from sands and loose muck it would not surprise me that those foundation would move 4 inches over 30 years. I’ve seen building foundations move 2 feet in 30 years. Virtually all older buildings have foundation movement. Typically the foundation movement is down. Especially in sands and muck. This would make long term readings from tide gauges virtually useless since the amount of foundation movement could not be determined. I believe they dont really know what sea levels are doing in any believable contexts. Jamie ==> “…Since most are located in harbors that typically have soils from sands and loose muck it would not surprise me that those foundation would move…” Yes, this is also the opinion of Morner and the INQUA Commission. 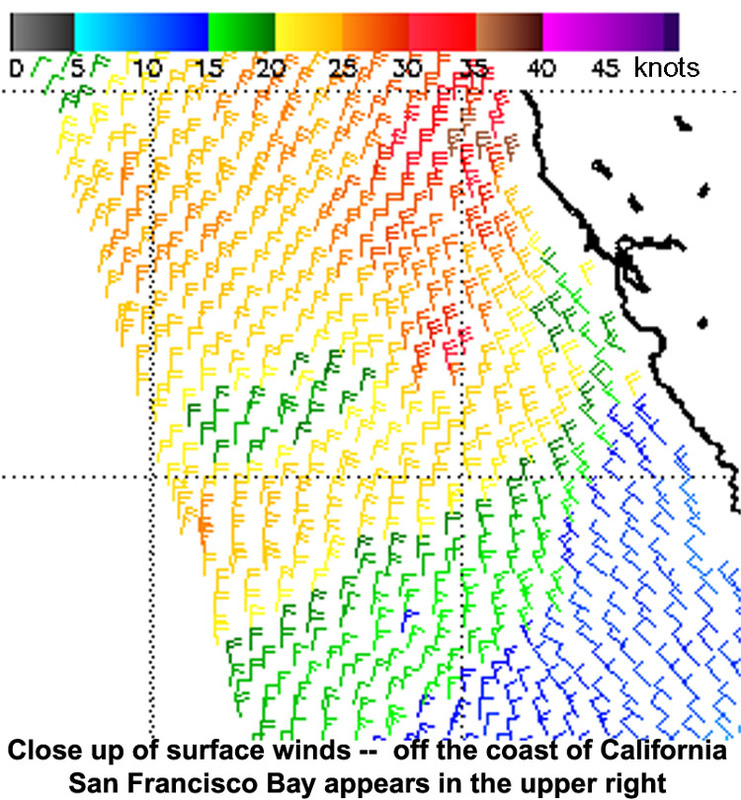 NOAA CORS is very busy gathering data to this effect with its continuous operating (GPS) reference station project. Don’t forget Darwin’s study of earthworm activity at Stonehenge in England. He posited that many of the uprights collapsed due to undermining of the soil from the worms. Has anyone looked into this as a possible addition to soil eroding under the gauges? John ==> I wasn’t aware of Darwin’s work on Stonehenge and Earthworms. Thanks…. Piers and docks and other harbor-front structures are almost always built on land that has been filled over existing harbor mud — it is a necessary act so that one can have a straight and flat-fronted dock to which ships can tie-up. Piers necessarily are on pilings sunk into the mud and muck (rarely to bedrock). To these structures, tide gauges are attached — also by necessity. All of these sink/subside over the years (pier pilings actually get shorter over time). Haven’t ever considered whether or not harbor-mud worms add to this problem….who knows? The problem is you can’t gather data on this now. Two foundations react differently based in site conditions. Some will move while others may not…..it isn’t like measuring GIA. This affects all the data collected prior to GPS monitoring. Jamie ==> Yes, that is correct….you can’t back-guess about Vertical Land Movement at Tide Gauge sites. A CORS receiver must be installed on the same structure as the Tide Gauge and then let run for several years to get an accurate idea of average annual movement that can be used to correct that Tide Gauge record for VLM. If you have another Tide Gauge a mile away, it needs it own Continuous GPS reference station attached to its structure. “One of the oldest tide gauge benchmarks in the world is at Port Arthur in south-east Tasmania. When combined with historical tide gauge data (found in the London and Australian archives) and recent sea level observations, it shows that relative sea level has risen by 13.5 cm from 1841 to 2000.” (that’s an 0.85mm/yr average) because Gondwanaland has been around a long time and aint going anywhere soon unlike a lot of other places you could stick a tide gauge. observa ==> You bring up a good point — the exact location and the geological structure to which the tide gauges are attached is very very important. Even when attached to bedrock, such as at The Battery, in New York City, one has to deal with GIA — the movement of the Earth’s continental masses as they readjust to the loss of the ice from the last Ice Age. This effect in NY causes the tide gauge there to “sink” at a rate of 1.3mm/yr. Kip, You also need to decide how much faith to put in GIA computations. I’ve looked into this a little and concluded that isostasy is surely real, but the modeling of isostasy — glacial or otherwise — is a long way from being settled science. For starters, there are at least two models of how continental rock responds to addition or removal of ice. And very likely neither is correct. I’m guessing that applying a conventional GIA correction to tide gauge data is probably better than not applying it. But believing the result is accurate looks to be an act of faith. Don K ==> GIA guess-timates do not, cannot, make valid corrections to tide gauge data — as the errors in the guess-timates are the same order of magnitude as the effect being sought (mm/yr). So far, the ONLY valid correction method for Tide Gauge data (and this is fully accepted by the PSMSL group) is to mount a CORS station on the same structure as the tide gauge, collect several years (3 or more) of continuous readings, and carefully process that data (no easy feat) to arrive at a good value for long-term average annual Vertical Land Movement. Groups like the Nerem’s claim to have adjusted Tide Gauges with continental averages for GIA…utter nonsense, totally inappropriate. No more valid than epidemiologists claims to have adjusted some “single food item” study for everything from smoking to reading habits. The temperature record is the same. The tools were designed for weather not climate. 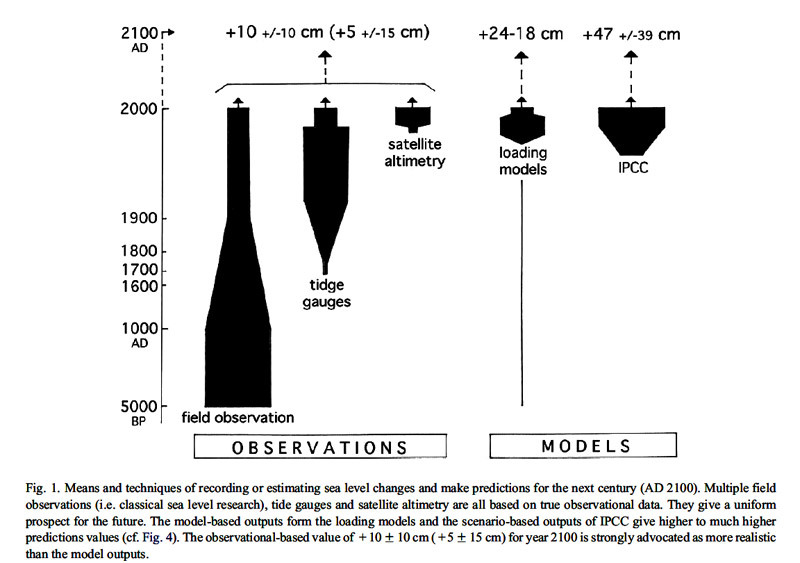 To achieve the required uncertainty levels for climate science a set of assertions are made about the metrology. The problem is that this places all work in the hypothetical rather than the actionable. It is an ethical question that academics and theorists sadly do not appear to understand. micky ==> It is, in my opinion, mostly a matter of the philosophy of science — how the current batch of researchers were trained — trained to be skeptical of their own findings and those of their predecessors? or trained to accept and go along? That’s a good point Kip. Also there’s nothing like working as an engineer or technician and be accountable to make you a better scientist. I have a house on a creek just off the souther portion of the Chesapeake Bay (west side). We get a tide on average of a little less than a meter. Just looking at my pier sticking out into the creek over the seasons, the water level at extreme low tide in the winter can expose half the creek bed under the pier and a summer flood tide can have the water level lapping at the pier deck.. a huge variance from one meter. Throw in an easterly wind pushing water into the creek or a westerly one pushing water out of the creek, just how can anyone ever measure a high or low tide to even 2 cm? I can tell you about when high tide is or about when low tide is, but that’s about it. About the only time any reasonable measurement could be taken is under a strong high pressure system when the wind is totally calm over the area for a period and even then I assume the extra pressure exerted down by the atmosphere distorts the reading. rbabcock ==> You are right, air pressure affects tide gauge readings much more than one would think — low air pressure raises tide gauge readings, high pressure lowers them. A very unsettled subject that is a favorite hobbyhorse of advocates. What is the reason for the extreme delay in the University of Colorado sea level updates? Anyone know? 1. Overall, the seas have been rising, slowly and inexorably, since the end of the last Ice Age. There is a thing called Holocene sea level highstand. We don’t know by how much it was, because it changes from place to place and it didn’t happened everywhere at the same time, but every geological expert that has studied this issue agrees that the highest sea levels of this interglacial took place thousands of years ago. Javier ==> Won’t quibble about it — meant as a general statement of the fact that as the miles-thick layer of land ice melted and retreated, the water returned to the oceans and ocean rose — and still rise slowly. Not really a definitive statement about paleo-sea levels. Not a minor detail, Kip. Sea levels are not still rising slowly. They were going down for several thousand years and have been rising slowly since the Little Ice Age. The same as glaciers. Daly’s stuff is interesting. And broad reaching. One thing though. Each radar return to the RA is a pulse that is the sum of wave amplitudes over the entire current footprint. That is to say, the satellite’s Radar Altimeter won’t see individual wave peaks and hollows, just a sort of continuous smudge that starts when the nearest peak reflects and builds as additional water surfaces reflect. And of course the individual reflecting surfaces don’t all reflect the same percentage of RA energy back to the satellite. Interpreting the pulse and deriving a meaningful cm range value looks to be a really obtuse problem that doesn’t exist in most radar applications. I have no idea how they handle the pulses and arrive at a high resolution range estimate. We may be stuck with whatever we’re told the accuracy is, because there’s simply no practical way for a third party to arrive at an estimate of the accuracy. DonK ==> Alternatively, “there’s simply no way at all for them to have arrived at an estimate to the accuracy claimed”. Excellent post. These are the kinds of posts (and many others) that maintain WUWT’s excellent reputation. I checked the tide gauge in Boston harbor. The gauge is well sited, at the pier at the Old Boston Navy Yard. The pier is a modern concrete and steel structure that is firmly grounded on bedrock. So any movement of the gauge will be due to tectonic forces only, such as post-glacial rebound or falling. There is no subsidence due to sediment settling or groundwater extraction, or anything like that. The Old Boston Navy Yard is the home of that fabulous ship USS Constitution. That’s right, Old Ironsides, herself. Stand on the pier, facing the ship, and turn to your right. Near the end of the pier, you will see a squat little shed, that looks like it could have been a guard hut. That is the tide gauge shelter. The USS Constitution is the only commisioned US Nave warship to have sunk an enemy warship in battle. So what can we learn from a single, well sited tide gauge? Obviously, we can not determine global SLR, due to local effects. BUT: Any global effects will be reflected in the local data set. 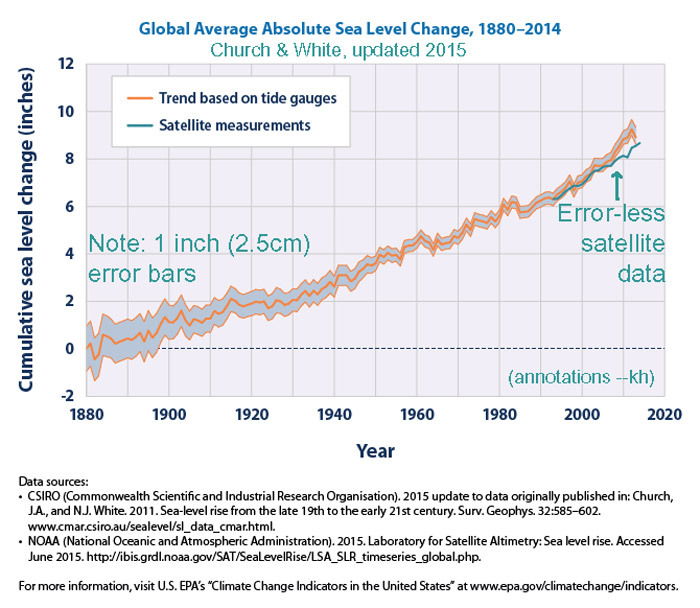 SO: Is sea level rising? Yes, trivially, this is true. More importantly, is SLR accelerating? Clearly, some average like 8 inches/century is not going to scare anyone. To drown Miami, put the Statue Of Liberty underwater by the year 2100, or any other scare story requires a SLR acceleration to a much higher rate than at present. It is this acceleration that will be seen in the local data, superimposed on whatever tectonic effects are present. So what does the data show? The Boston record starts Jan 1921 and continues to the present. The Blue line is the least squares linear fit, the Red line is the X^2 fit for acceleration. As you can see, the X^2 fit overlays the linear fit to such that it is difficult to even see the linear fit. What’s 16 orders of magnitude between friends? Now if you look carefully, there does seem to be a bit of a wave pattern in there, Let us proceed. OK, so it looks like a sine wave, and the polynomials are a crude approximation. The full wave seems to be about 894 months, or 74.5 years. That is not very illuminating. BUT: we divide by 4 and we get 18.6 years. 18.6 years is the period of the nodal precession of the Moon’s orbit. I have seen on “reputable” websites which promote Global Warming, charts of SLR very similar to this. They start the graph in the mid 1970s, and portray the upward curve of the nodal precession as the SLR acceleration which is going to drown us all. Shameless! Postimg ate my graphs! Try again. TonyL ==> Boston has the interesting position of being right sat the “hinge point” of GIA for the North American East Coast. The land mass north of Boston is rising and the land mass south of Boston is sinking — due to the release of pressure as the weight of the miles thick glacier ice of the last Ice Age melted and Earth’s crust is spring back up — which tilts the southern portions down. Boston’s tide gauge data shows typical patterns — wild swings of 10cm and more over short (years) periods, both up and down, and for Boston, a long-term slight rise — over the period shown of about 30mm/10 3cm — noise the same magnitude as the long-term trend. Once they install a CORS station on the same structure (pier) and run it for 3 or more years, the local relative long-term sea level change can be determined. Understood. Boston SLR is 11.1 inches/century. This struck me as a bit high for a eustatic value, so I thought that Bos may be sinking a bit and the hinge point may be a bit farther north, Portsmouth, NH or Portland, ME, for instance. What I did find remarkable is that the Moon’s nodal precession popped out with an error of just ~2 weeks over a cycle of 18.6 years. Of course, the precession is a minor and second order effect. Yet it is quite clear in the overall data. That fact alone gives me confidence that the local SLR measurement is accurate and reliable. TonyL ==> Boston’s 11in/century aligns nicely and comfortably with the “generally accepted” global figure of 8-12 inches/century. We’ll know more in 50 years or so, as CORS stations get established to correct tide gauge data (allowing us to have reasonable estimations of regional trends) and we have more accurate long-term satellite data. It’s also possible that the Tide Gauge at Boston isn’t positioned on competent bedrock (e.g. Cambridge Argillite), but rather on one of the glacial clays that are prone to creep out from under things built on them. Better than Boston is the UK station of Newlyn. This location is also the permanent elevation datum for the UK Ordnance Survey and a brass bolt benchmark has been in place since 1915 and regularly surveyed. The tide gauge location is on a granite pier on granite bedrock. A permanent GPS level has been in place since 1998 and shows a slow steady sinking of the land of 0.7mm/year. The tide gauge shows a linear trend of 1.8mm/year increase so the actual sea level rise at Newlyn is trending at 1.1mm/year. Seems about as accurate as you can get. The referenced paper suggests an accelerating rate since 1993, but correctly points out there are several other 20 year periods in the tidal record that could be cherry-picked to have high rates. This type of set-up, absolutely required for for accurate measurement, still ONLY tells us about LOCAL (or maybe regional) changes in sea surface height — it cannot be assumed to tell us about Global Sea Surface height changes. I’m not as generous as you to those Colorado Univ. scientists and grad students who merely run through the processes that they’re taught and generate numbers and statistics without critically evaluating their own biases. I feel that if that’s the way they approach scientific questions, perhaps they should seek work in the fast food industry. Mickey ==> Thanks for the Willie Soon quote. “It’s not so easy.” Gads, I wish I had said that! Very interesating, Kip. Your NOAA chart shows sea level rise at 2.9 plus or minus 0.4 mm per year. Within the standard error this agrees with Chao, Yu, and Li in Science (April 12th, 2008) who found that sea level rise had been stable for the previous eight years at 2,47 millimeters per year. This amounted to just under ten inches per century, not the twenty feet that Al Gore was touting at the time. I wrote to the editors of both Science and Nature magazines anout it but had it thrown back into my face, unread. Al Gore got a Nobel prize out of it and I could see that the fix was in. And it satill is in thanks to irresponsible and incompetent editorial policies favoring global warming in their publications. This despite the fact that the greenhouse effect they all depend upon has been has been proven not to exist by Ferenc Miskolczi. He used a 61 year long NOAA radiosonde observations and found that despite an increase of more tha 20 percent of atmospheric carbon dioxide there was no increase of global temperatutrre during this same period of 61 years (See Energy & Environment. 21(4):243-262 (2010). Before I approached these journals I had done a lot of research and eventually put it all together into a book I called “What Warming?” It came out seven years ago but its scientific content is still up to date. Amazon has it. Do you see any acceleration? I don’t. tty ==> What I see in this graph is the very common high level of noise over signal — with a 125 years variance of 1 whole meter, but over all nominally flat – trendless. Suppose some sea rise is indeed due to humans? But at a much slower rate of increase with the alarming coastal flooding occurring slowly over another 300-400 years or more? Are we supposed to care? Really? That seems like pioneers in the 1800s worrying about the environmental effects of clear cutting. Or like farmers in the dark ages worrying about long term erosion control. Or Egyptians worrying about the long term effects of quarrying. There’s another class of potential satellite sea level measurement errors that I’ve never seen addressed — satellite orientation. The problem is that we are trying to measure very small distances from an orbiting platform. For Topex, etc we need to worry about things like the fact that the RA antenna is not located at the satellite center of mass. Moreover, the RA antenna is free to move around the ‘satellite position’. Miscompute the RA’s position by a couple of centimeters and you have an additional error comparable to the uncertainty in platform position. I’m sure the platform engineers are aware of this and it is corrected for. But how much additional uncertainty is introduced? Don K ==> Haven’t seen anything on orientation correction in the mission paperwork. But yes, it would be a problem is the satellite is not tracking the orientation of its receiving antenna relative to the distance to be measured. There are just way way too many inaccounted for variables and confounders to claim a millimetric precision. Good article, and correctly spotlights the alarmists’ stance that if all land ice melts, the sea level would rise 300 feet. But currently measured sea level rise is independent of that and is today’s concern. As the article states, tidal gauges are adjusted for vertical land movement, but what’s omitted is that subsiding land is generally a gradual process while uplifting land is usually sudden, i.e., earthquakes. These two counterbalance, else land would have disappeared long ago. But only gradual land movement is included in the SLR calculations, with sudden movements screened out. 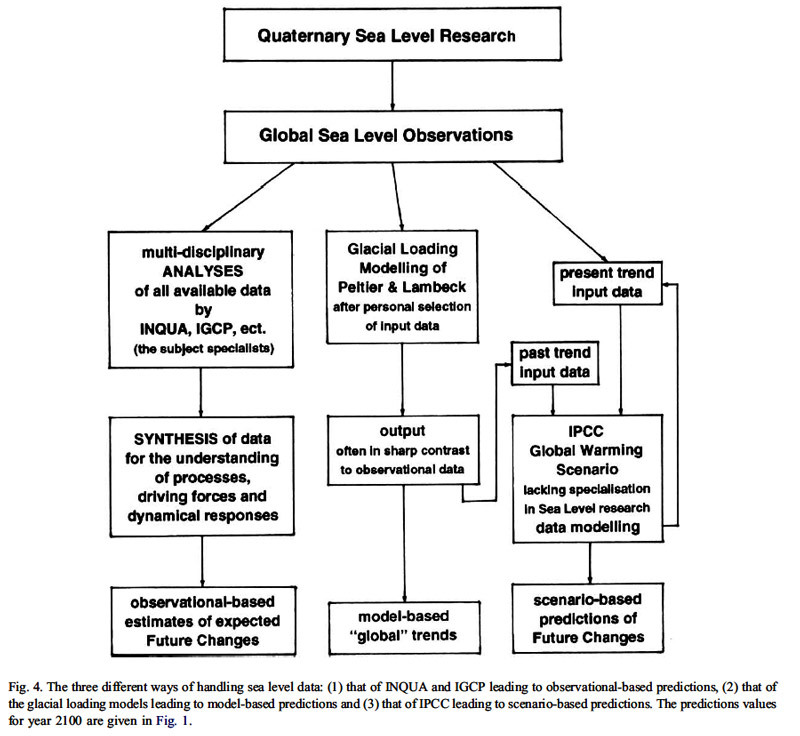 This methodology guarantees a rising sea level outcome regardless of the physical reality. Ricdre ==> Well Done, sir! I’m sure Monk could sort out this whole sea level rise problem, disorder and confusion are what he specialized in. Ricdre ==> Tony Shalhoub is a comedic genius, no doubt about that. and the Randy Newman’ theme song for Monk. I agree with your December 19, 2:22pm rant. and The King of Queens. this article near the end of the comments! Richard ==> It is a good sign that even though we have disagreed in the past, we can still find common ground in good clean humor and simple decency. Kip – nice write-up and I don’t quibble with your conclusions, only with your suggestion that “computational hubris” is the cause for the uncertainty. Allow me to suggest an alternative take on why we are where we are. Consider the non-computational difficulties Steve Nerem is confronted with. At present Steven has his name on his own office door, a steady public-sector paycheck (indexed to inflation) that pays for his mortgage and his cost of living, probably with enough leftover that on weekends he can afford to splurge on a $30 mid-level California Cabernet. He is employed as a scientist in his chosen field. Funding is provided and predicated on interpreting data supplied by another branch of the growing academic-industrial complex. As a mid-career scientist Steven is in deep. His only path is to continue forward with the deception. Any hesitation or equivocation about the importance and validity of his research will result in his replacement. There have to be dozens and dozens of young, hopeful post-docs who would be more than willing to whisper him out of his position, who would character-assassinate for his job. Steven knows that and what it takes to keep the administrators and program directors happy. Steven knows how the sausage is made and knows that if he doesn’t toe the line the best career opportunity available to him will be to manage the local Ace Hardware store. So no, I don’t buy the computational hubris argument – I prefer a deep-state careerism explanation. He has long ago lost his soul as a scientist; now it’s all about career preservation. And he’s not alone. NVW ==> It is difficult (impossible) to judge the motivations of others — even harder for those we do not know and have never even met. I’m sure each individual has his/her own mixture of reasons, motivations, hopes, desires, fears — and individual methods, routines and approaches to protect themselves from life’s problems. My Computational Hubris point is that a steady scientific mind, logical and disinterested, a little bit skeptical, ought to be able to see clearly that these ultra-precise (infinitesimal) findings in sea levels, epidemiology, exo-planet research, scientific cosmology are simply not possible when all the confounders and uncertainties are taken into account. They are, as Feynman said “fooling themselves”. While you cite only one there are two options for Prof. Nerem. Either he is computationally incompetent and unable to account for the large errors of measurements (this would be your Computational Hubris). Alternatively, he is well aware of the deficiencies of his measurements but chooses to ignore them (in today’s world this corresponds to career preservation). To paraphrase your Feynman quote, he is either fooling himself or fooling others. Which of the two is a greater scientific error? nvw ==> I prefer to give people the benefit of the doubt, and put myself in their place and imagine what I would be doing and how I would feel. Nerem, personally, has shown himself to be a blatant CAGW Alarm Advocate by his co-authoring the ridiculous, entirely unscientific WaPo article — but I doubt that this allows him to mislead the rather large sea level group at CU. Kip Hansen, I would really like to be able to produce the graphs that you present here on my own computers. However, for this I need numerical data, not plots. Are the numerical data publicly available? A link (or other directions) would be much appreciated! I cannot comment effectively without having the numerical values,since my methods differ fundamentally from any that you have presented. Yes, there’s plenty of numerical data publicly available. For tidal gauges, try the PSMSL site http://www.psmsl.org for starters. But keep in mind that tidal gauges are not randomly distributed and are subject to all sorts of problems including such things as ships damaging the reference markers. 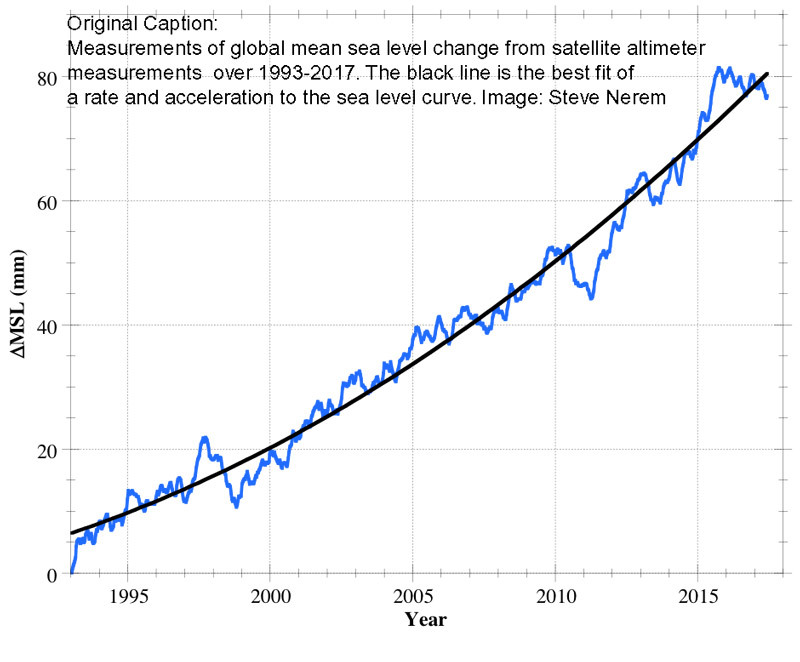 The averages of the relative sea level change from tidal gauges can reasonably be expected to differ a bit from from the eustatic sea level change observed from satellites. How much is “a bit”? No one knows. Most studies on tidal gauges are performed using subsets that are assumed (hoped) to have characteristics that will yield a reasonable result. For satellite data try the Colorado University site http://sealevel.colorado.edu/ But keep in mind that although satellites measure actual (eustatic) sea level, the CU folks fudge the reported value upward by about 12% with a dubiously appropriate “ocean volume” correction. We have no way to know what other, less obvious, fudges they may be applying. Here are two links to Jason/TOPEX data. This should get you started. Robin ==> I see that Don and Tony have given you some pointers to modern sea level data — make sure you understand the caveats that come with each source and type. Morner’s images harder to reproduce, though he gives sources for it. The AVISO site has move [to here ] since he supplied links and I am uncertain that they still offer the original raw (-est) data. I try to include URLs in the images themselves except where they are explicitly taken from a paper which is itself already linked. If you have any trouble findings something specific, ask again. I noticed a curious thing on the sea level chart. There was a two year sea level drop corresponding to the 1998, 2010 and 2016 El Ninos. William ==> You’re right. Read Morner’s papers (linked here and some at the Jo Nova blog) — he too points out ENSO related blips. completely unreasonable claimed margins of error. Thanks for reading this essay, and especially those who took the time to share their opinions and questions with the wider readship here. It is incumbent on us — those who remain properly scientifically skeptical of “hue-and-cry of alarming doom” spread by fame seekers and sufferers of “Jor-El Syndrome”, wildly, frantically trying to “save the world” from disasters that will never come — to keep up the effort to set the record straight, point out the gaping holes in hypotheses, shoot down unscientific claims (230 feet of sea level rise…), and keep up the pressure on practitioners of doom in hopes of reining in the worst of their absurdities. Kip, it is a sad reflection on human nature that it takes a thorough scientific examination, involving much work, to debunk the politically-accepted work of other scientists. Work which a half-educated layman, like myself, can see through with a little thought about all the “known unknowns” involved in it. Satellite sea-level measurements – the accuracy of, I mean – are the stuff of the fairies living way down the back of my garden. I wonder why pressure/depth sensors aren’t being used, as wave motion cancels at the scale found at typical tidal stations. The error for a gauged/vented sensor is just +/- 1 cm. *Because two sensors are required – the errors combine. As both atmospheric pressure and water pressure are measured separately. Scott ==> In my previous essays in this series, I give links to NOAAs technical data on the tide gauges currently in use. The accuracy of instantaneous readings is really a function of physical design and can not really be circumvented. Yeah, you are right, I had my mind focused on solving the measurement issue and was thinking about how pressure sensors might overcome the surface deformation problem (At sensible wave height/depth scales!). What bothers me most about this readership is that they do not react to really big news. Really big news wpwould be, for example, proof that the greenhouse effect has been proven non-existent. I have been a bearer of this news because Ferenc Miskolczi did just that and I want this widely known. His achievement is in publishing a peer-reviewed paper seven years ago which proved that the hteenhouse effect does not exist, And yet he is still an unknown. . There was dead silence about it from the Gkobal Warming groups who then proceeded to pretend that nothing had happened. I would have expected that but I do not understand the skeptics who stood aside instead of spreading the truth about the non-existence of the greenhouse effect. I think we should increase our efforts to bring it to the public who is filled with global warming propaganda. We It is important to to dethrone the green giant who still controls the world! Thanks to the belief in his alleged greenhouse powers we have been subjected to the insanities like the Kyoyo Protocol, The Copenhagen Agreement, theParis Treaty and whatever came out of Bonn. The only thing justifying them is greenhouse warming. Take that away and they collapse. These treaties are also simultaneously set up to help “underdeveloped” nations to work their way up into developed nations by giving them money collected from developed nations, namely us. The pretext is that we, tthe developed nations, caused all this “anthropogenic” warming and should bear the cost of fixing it by developing the undeveloped. It is not a small amount either, it is billions and keeps increasing. It has been successfully side-tracked from just climate mitigation in order to make up up for their “suffering” from global warming that we developed nations caused. Knowing that no greenhouse warming is on the way should open our eyes to the lies cand swindles used to make us believe in warming. An example of the scale of this this is the Paris agreement where 200 independent nations were swindled into signing the treaty. Swindled because the climate emergency they collected it for is a lie. Nothing but smart political propaganda was needid to accomplish this international coup. The fact that there is no greenhouse warming also cuts off the legs out from any argument that they must get the money to fight warming. . The fact that there is no greenhouse warming also means that all the laws and regulations enacted to reduce warming are a total waste and must be rescinded. Likewise, moneys collected to fight warming physically should be turned back to the donors because there is no warming to to fight. A post by Judith Curry that I found indicates that Miskolczi does not use the same definition of “greenhouse effect” commonly accepted by those trying to determine its role in climate change. She says his results are not useful and notes that Roy Spencer and others have been critical of his work. False, un-Scientific-Method-based reporting on Sea Level Rise is rampant. NASA and NOAA are complicit with the universities and various NGO’s. They have two goals: run the Republicans out of office, and end all mining operations. Think about it: they Hate Mining! All mining: coal, oil, Nat-Gas, Metals, all mining requires the destruction, at least temporarily, of Natural Habitat, and they Hate All Mining! Just think how great our world would be without mining: natural habitats (they love the word “Pristine”) still Pristine, bugs and bunnies and Lions Tigers and Bears doing their thing, Adam and Eve lurking about somewhere, and everyone required to drive a virtue-signaling Prius. For the life of me, I cannot imagine any other reason why the Greens and their fellow travelers do what they do. Shall we return to the Stone Age? Wasn’t the Stone Age so great? Help me out here: what are The Greens thinking? Or do they think, maybe rather they just Feel, and Empathize, and worry about the snail darters. I just dont get it at at all. The ocean is gravitationally flat. Yes the wind blows areas up, pressure depresses some, but its flat. Add on inch here, and everywhere, high or low rises by one inch. Just look at the thousands of ancient places, around the world, built on the sea that are still lived in. All you need to do is check the records of say four identified stable areas. We now think we have the capability to measure ground level relative to absolute references in orbit — GPS although maybe not that specific instrument set. But today, making those observations is quite difficult and takes many years. Ask again in a decade or two. Grey ==> This is one of the surprises that the satellite era has brought us — the seas are NOT flat, they are not a bathtub, adding one inch in Australia does not raise the sea height in Boston by one inch. Earth itself is not “gravitationally flat” see here..
Globally, the seas are rising and falling simultaneously in different areas in rather odd patterns. Gray ==> You’ll have to take that issue up with the GRACE people here. – isostatic rebound displacement How much sea water is displaced by the shallowing of the sea/ocean area’s at rebounding zones? – sedimentation displacement: each river does transport sedimentation into the oceans how much volume is displaced by this? Same for coral growth Corals become solid rock structures how much water is displaced by this? Frederik ==> The sea level groups have cocked up a GIA adjustment figure, the 0.3mm/yr adjustment claimed for the increase in the volume of the ocean basin — it is quite controversial and does not represent an actual rise in sea surface height, but sort of “the sea would be 0.3mm higher if the ocean basin hadn’t gained volume due to GIA” — an ad hoc “trying to increase alarm about sea level” sort of thing. In the end, it matters not what is raising sea levels at the sea wall in your backyard — at at the sea wall in Battery Park, New York. If the sea is coming up there, it is coming up there and you have to deal with it. Kip, do they even know what “acceleration” means, it certainly is not a rising straight line. Gray ==> The effort among SLR Threat Advocates is to try and “prove” that although SLR is slow (a little bit at a time) it is “rising faster and faster” — accelerating — and thus if not scary now, it will be soon. See Nerem’s Washington Post absurdity linked in the main essay. By acceleration, they mean that the rate of change is increasing. The trouble is, as I see it and have explained, is that the entire change is so small, and dubious, uncertain, and even careful local data sets are so noisy that we are not going to know about Global Sea Surface Height change rates for many years yet — they have to install continuous GPS reference stations on the same structures as enough important tide gauges to get regional change rates first — then maybe we can work out global change rates. Satellite measured sea level will not inform us of anything useful until they make the entire procedure transparent, release all the code and all the ad hoc adjustments, each one justified by broad public peer-review, and openly show how they arrive at their claimed results. My opinion is that they are attempting a task not yet possible using the methods and procedures currently in use — they are just guessing with computers (Computational Hubris). I definitely agree with that: as in the end all that matters is the “relative sea level” in some area’s it is falling, in others it is rising compared to the landmass. If the mean sea level would be falling at an inch per year but your land would be subsiding at 1 foot per year, you will have an 11 feet sea level rise to deal with in that area in 12 years (taking the extreme example as a way of speking). In the end global sea level may rise or fall if the landmass has an opposite movement it easily can cancel – whatever the global mean sea level is doing- out. That’s why i prefer the tidal gauge data, even not corrected for the landmass movement, it is the data that matters, that show no acceleration and that diverges from region to region. It also show what we have to deal with…. Frederik Michiels ==> You might like my other Sea Level essays linked at the top of the main essay above. Kip, isn’t Mr. Michiels’ comment about displacement addressed by Prof. Neren’s correction for the “change in ocean volume due to glacial isostatic adjustment”. Can you address this correction further? Is this just another “calibration” that creates accelerating slr out of nothing, or is it some cryptic physical adjustment that is sleight of hand hoping no one would notice. At any rate, thanks for the post. Your article gives me much insight into the sausage factory that passes for science. How can the layman navigate this mess? I’m a retired lawyer who has studied climate science for years, and this “calibration” question exemplifies the problem. We’re dealing with data that is imprecise to begin with, which is then manipulated by scientists in some opaque fashion that ordinary people cannot possibly understand. The tendency for the layman who has only a mild interest in the science is to give the science community the benefit of the doubt and believe what they say. Most folks don’t understand the perverse set of incentives that push scientists into agw advocacy. And let’s look at some prominent skeptics for a moment. Does anyone other than John Christy and Roy Spencer understand how the UAH satellite temperature record was arrived at? If so, maybe they could speak up here and explain it in a way that the ordinary well-educated layman can understand. Or is it just another sausage factory that is intentionally opaque. I’d like to think that Roy and John wouldn’t intentionally concoct some rube goldberg device that supports their skeptical worldview. But I believe them because of my own leanings and because I’ve read what they say and find them lucid and straightforward. A leap of faith is required to believe them and I guess I’ve made the leap. I could go on but that’s enough for a while. scraft1 ==> For an explanation of the “GIA Adjustment” see this link. For a more exhaustive look at the issue, see this pdf. Great article, thanks. I wholeheartedly agree that only local sea level changes are worth talking about, because there are so many variables that go into mean sea level. And by “variables,” I mean things that vary over time. The three dimensional shape of the ocean is not constant. You may find this article of interest. It discusses the difficulty of establishing “mean sea level”, even that associated with a hydrostatic equilibrium definition of a plane of constant gravitational potential (minus local centrifugal force). Michael ==> Yes, a very nice description of the details about MSL, elevation, GPS, the geoid, etc. Whilst reading the comments on how muchare sea levels rising , I would like to ask the perhaps simple question. What causes sea levels to rise? Here is my list – there maybe more. Melting glaciers, thermal expansion, sediment from rivers and glaciers, ground water extraction, tectonic plates movements. Would it be possible to quantify any of these? David ==> Many groups are working on such things, some they think, with enough Computational Hubris, they can get a handle on. Using the GRACE satellite, they have tried to guess-timate how much extra glacial and ice sheet water is flowing into the seas and there is some guesses at thermal expansion. The other items are simply mostly-unknowable at this time. If the latter is in the ball park we will soon know.!!! Fig 10 in the link shows a millennial solar activity peak at 1991+/-.. Because of the thermal inertia of the oceans there is a variable delay between this solar driver peak and the various measures of climate change. 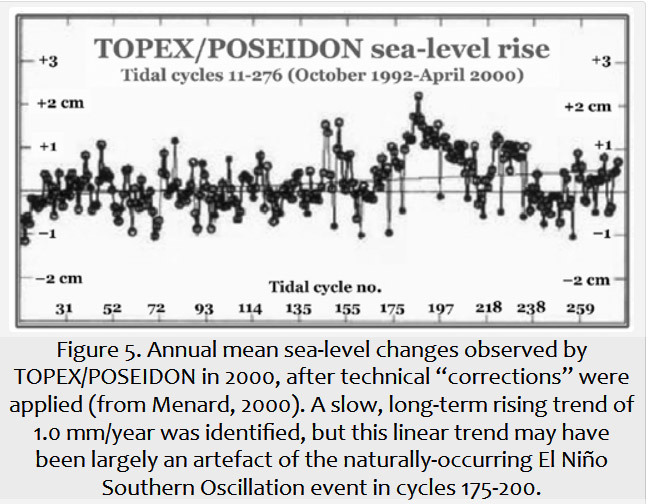 Global Sea Level – Post Little Ice Age Maximum possibly at 2015/16 – delay 25+/- years . If the last is true we should know within the next 5 years or so.!!! I would expect in general falling seas from now until a possible next little Ice Age low at about 2650. Dr.Page ==> Let’s see how it goes over the next couple of decades…..if we do get a good strong cooling, it really may slow the long-term gentle rise of the seas but it will have to be strong and long. I rarely find one that stands out from the crowd. of an ever changing surface. which few authors do so directly. just to annoy you, Hansen! not that I’m any kind of brainiac. should have been the hot links to them. were not clear enough for a title. Richard ==> That’s very kind of you — appreciate the compliment. I do try to fulfill what I see as my role as an essayist on science and health topics, and am gratified that this particular effort filled the bill for you. Your suggestions for improvement are not annoying, they are quite helpful. I will be sure to make links more obvious to the reader in the future. The use of Computational Hubris as a non-transparent title was intentional — and worked in as far as it caught your attention :-). I do worry about essay length here at WUWT, where I feel the attention span/patience level is shorter, just my impression — but not so much at Judith Curry’s where the readership is different. I’m a simple electronics engineer. The tide here is from 6.5 to 7.5 FEET every 6 hours give or take a foot or two. The waves offshore are from 1 to 35 or 40 feet high, depending on which storm is tearing the place apart at the moment. How in hell can anyone measure the sea level to the millimeter level? I’ve lived in the same place since 1981 on the tidal Ashley River in Charleston, SC. There’s a steamboat dock with cypress posts that was installed in 1830-something across the river from us at histeric Magnolia Gardens and Tourist Trap. Its high water mark is right where it was in 1850 or so. Marking mm on it would be insane. I’ll let you boys know when it goes underwater, except for major hurricanes like Hugo…..
Is the water rising or, more likely, is the tide gage SINKING in the mud and plate tectonics? Larry ==> Thanks for the report from “Our Man in Charleston, SC”. Charleston is one of our favorite stops on the Atlantic ICW.